The capital is Maebashi 前橋市. former province of Kozuke　こうずけ【上野】Koozuke. 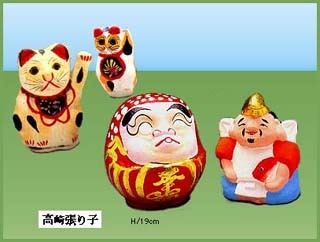 Kami-kenu and Shimo-kenu were referred to as Jomo (Joomoo 上毛). Gunma is Silk Country ! This is the symbol of "Silk Country" Gunma. It was the first model factory in Japan built by the Meiji government in 1872 to modernize raw silk production. ... And in June 2014, Tomioka Silk Mill and Related Sites were added to World Heritage List. governor of Gunma Prefecture, promoting the silk production of the prefecture. They were put on the family altar during the New Year celebrations around January 15, to express the feeling of greatfullness of the farmers and pray for a good harvest in the coming year. They were made of bamboo and straw, usually by each family in their own way. Thin fibers spun together form thread. It is then separated into woof (horizontal) and warp (vertical) strands, which when woven together on a loom become fabric. The weaving technique employed to produce Kiryu Ori (Kiryu textiles) has been designated a Traditional Industrial Art. While textiles are commonly used to make kimonos or western style clothing, they can also be used in a variety of ways for interior decorating. There are various methods for weaving, however, the basic techniques are plain weave, twill weave, satin weave, and gauze weave. Plain weave is characteristic of such fabrics as pongee (silk having a knotty textile), crepe, shirt fabrics, handkerchief material, etc. Having the same texture on both sides, this fabric is very strong. Twill weave fabrics are characteristically used for brocade obi (kimono sashes), gold brocade, cotton denim, wool fabrics, and other close-weave fabrics which are strong but soft. Satin weave fabrics are characterized by satin and other high luster, glossy textiles. Gauze weave fabrics are characterized by various types of sheer, light silk gauzes and other various Jacquard weaves and layer-woven textiles. ..... Kiryu's fiber industry is a traditional local industry. ..... From the Edo Period, merchants from Sakai, Kyo, Omi, Nagoya, Edo and other cities came to Kiryu contributing to the development of the city as a textile center. Artisans from Kanto, Tohoku, Koshinetsu, Noto and other districts were attracted to Kiryu by its developing industry, further contributing to the formation of Kiryu's local culture. It is not known exactly when textiles first began to be produced in Kiryu. However, there is evidence that in the year 714 of the Christian era silk was woven in Kozuke no Kuni (present day Gunma Prefecture) and sent to the Imperial Court. In the year 905 a silk tax was levied on the area (in most areas the tax took the form of a rice tax instead). It is, therefore, possible to affirm that silk was manufactured locally from antiquity. Between 1384 and 1392 there is mention in various records of locally produced silk, known as Nittayama Silk, which was transported to other parts of the country. Before this time it is said that the soldiers of the local Lord, Yoshisada Nitta, while carrying banners made from Nittayama Silk, conquered the Kamakura Shogunate in a battle at Ikushina Forest, an event of great significance. From the end of the Onin War (1467 - 1477) there ensued a time of change during which the silk industry underwent a decline. Around 1600, however, it resurged and when in October of that year Lord Tokugawa stood to fight Lord Ishida at Sekigahara, his soldiers carried silk banners produced in Kiryu into the battle. It is said that on one day some 2,410 silk banners were brought to the grounds of Tenmangu Shrine to be blessed before they were carried into battle. After this time, during the Kanbun-Enpo Period (1661-1680) many people began to work in factories and came to Kiryu from Kyoto, Osaka, Edo and other distant areas. As a result of the steady growth in the silk industry, the Silk Market was opened in Kiryu in February, 1738. In that same year, mechanized looms began to be employed and new types of textiles were produced. As for the silk market, it is difficult to express in words the great prosperity it met with. Even today people remember the booming days of Kiryu's silk market. With continued success year after year, Kiryu began to produce silk of increasingly high quality and the city grew in fame. Given this background, it is not hard to understand why the local people long for the days of the prosperous silk industry and are eager to preserve for posterity the events of those times. The commemorative illustration of the Kiryu Sayaichi (Silk Market) is an attempt to show graphically the circumstances of that period. The Kiryu Sayaichi Silk Market illustration was painted in Meiji 27 (1894) by Toko Oh-Ide, a Nanga painter from Kiryu, and the essay above which accompanies the painting is by Haruhiko Kojima, the Mayor of Kiryu at the time who was also a poet. This layered fabric is woven on a Jacquard loom using pre-dyed yarn. ..... Kiryu Chiami Gaito archeological site. 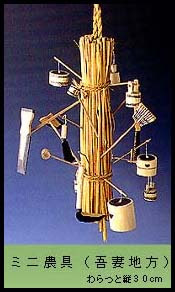 ..... A traditional industrial art is a technique or method which was in use prior to or during the Edo Period, and which continues to be in use as a technique or method for the production of local craft items. Taken from the legend from temple Miroku-Ji talks about a mountain ascetic who became a tengu goblin. One woodcarver made this image from the mountain pepper wood.
. Kashozan, a Tengu mountain 天狗 .
. hikimono 挽き物 things made on a wheel .
. kendama ケン玉 cup and ball .
. Daruma otoshi だるま落し hitting Daruma .
. Takasaki Daruma 高崎だるま .
. hakuroku daruma 白鹿だるま white deer Daruma . A papermachee doll and a cookie !
. Takasaki hariko　高崎張子 more papermachee dolls . 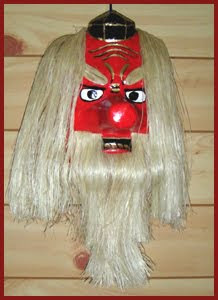 lion head "to cut away insects"
Used for a dance to ward off insects (mushi fuuji) . They are made from light paper and children can wear them. Parents with children who suffered these ailments would get such a lion head and place it in the child's room.
. mushikiri dorei 虫切り土鈴 clay bell .
. Mushifuji Inu 虫封じ犬　Dog to ward off the three mushi . Perhaps Issa is experiencing what in Japanese is called yuki-bara (雪腹 snow stomach). This refers to one's stomach and intestines becoming chilled and painful even before snow begins to fall as well as while it is falling. Hara can refer to the stomach alone but often means the whole abdominal area, and, by extension, guts, courage, spirit, and mind as a form of visceral feeling. I follow the reading of the hokku by Maruyama Kazuhiko in Shintei Issa haiku-shuu 137.
. Reference and Photos . 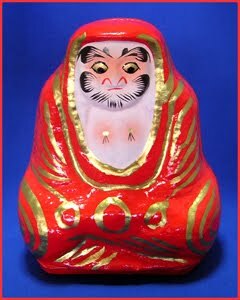 Asahi Narumi .
. Gunma Folk Toys - this BLOG . mushifuuji no Yakushi 虫封じの薬師 "Yakushi warding off the three worms". The main statue is 聖観世音菩薩 Kannon Bosatsu. It is also known as Mushifuuji Kanzeon 虫封観世音 Mushifuji "Kannon to ward off "insects"